When are tree and shrub applications accepted? 2019 applications are accepted beginning October 1, 2018 and until all species are sold out or until lifting and distribution is completed (approximately mid-May). All tree and shrub applications are sent to the Griffith Nursery for processing. We accept checks or money orders payable to the Department of Natural Resources. Orders submitted by January 31 should not send payment with the application, as a billing invoice and order confirmation will be mailed to you. Payment is due within 30 days of the invoice date. Orders submitted on or after January 31 must include full payment with the application. Note: We hope to implement a credit card payment option by our next ordering cycle. Who can order our seedlings? Individuals or groups who own land in Wisconsin may purchase DNR seedlings for reforestation and conservation purposes. DNR seedlings may not be used for decorative, ornamental, landscaping purposes or Christmas trees. A minimum order consists of "a packet" equal to 300 trees or shrubs of the landowner's choosing in increments of 100 of each species, or 500 shrubs or 1000 trees. How do I receive the bulk price? To receive the bulk or ungraded price, you must order 3,000 or more of a single species and age class. For example, an order of 3,000 2-year white pine uncounted and graded is $19.40 per 100 or $17 per 100 if uncounted and bulk. How will I know if I am going to receive the trees I ordered? A confirmation letter will be sent to you when your order has been processed and shows the species reserved for you. You also will receive an invoice for submitting payment to us within 30 days. Note: Full payment must accompany orders submitted on or after January 31. What happens if only part of my order is filled? Orders are filled with the stock requested if it is available. On the application, you can choose to have the nursery make a suitable substitution on your behalf or request that the nursery contact you to discuss your substitution options. If necessary, a refund will be issued or you can call us to make additional adjustments. When do my trees arrive? Seedlings are shipped or available for pick up at the nursery from April to mid-May. You can opt to have your seedlings delivered to your county by a nursery truck. In this case, your local DNR forester will notify you of the pick up date and location (see application for delivery charges). If you elect to pick up your trees personally at the nearest state nursery, you must contact them with your pick up date. 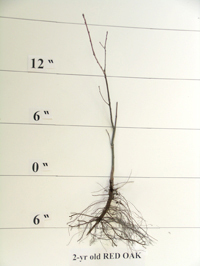 How big is a typical seedling? Where do I get technical assistence? Contact the DNR forester in the county where you will be planting the trees for assistance in developing a planting plan and selecting appropriate species for your site. The address and telephone number are listed on the tree application. Who should I call if I have any questions regarding my order? Please call or email Jeremiah Auer or Carey Skerven at the Griffith State Nursery 715-424-3700 for any concerns you may have regarding your tree order.